As London prepares for the introduction of congestion charging, the city of Birmingham is looking for ways to beat its own traffic woes. Birmingham is known as Britain's motor city - a metropolis built around the car industry. The city is well known for its Spaghetti Junction road network and has been chosen as the location for Britain's first toll road. At the moment Birmingham is undergoing a major revamp, and new leisure and retail developments are expected to change its reputation as a "concrete jungle". But what improvements can we expect for the thousands of motorists who battle their way through the city every day, and commuters who rely heavily on its public transport? A recent report suggested £7.5bn was needed to alleviate the current congestion problems in the Midlands. The West Midlands Multi-Modal Study, commissioned by the government two years ago, said most roads would grind to a halt unless radical changes were made. Recommendations made in the report included better bus services, bus lanes, new underground platforms at the city's New Street station, and tolls on some of the busiest roads in the area. Since the report, bus lanes have been introduced on some roads and Britain's first toll road is expected to open in the city at the end of the year. The £700m, 27-mile road will bypass the most congested parts of the M6 in Birmingham and charges are due to be announced later this year. Birmingham City Council said there were no plans for any more toll roads in the city. Jonathan Simpson, spokesman for the RAC Foundation, said one of the biggest problems facing drivers in Birmingham was parking. "The council employs contractors to monitor parking who have targets they have to meet with regards to issuing tickets," he said. "We have had so many complaints from people who were unfairly issued with tickets. "Most of the people who challenge these tickets win, which tells me that most of the tickets are issued unfairly." Despite recently buying a new car, finance worker Caroline Baker chooses to catch the train into Birmingham for her job because of parking problems in the city centre. "Whilst my monthly train fare was less than £50, parking would have cost me nearly as much as that per week," she said. But although Ms Baker prefers to take the train, RAC information manager Malcolm Phillips said this was not the usual choice for many of the city's commuters. "Public transport just isn't good enough to entice people out of their cars," he said. Stuart McGann works in Birmingham city centre and travels 24 miles down the M6 from Coventry to Birmingham every day. He said it was imperative that he arrived at the M6 by 7.25am, otherwise he faced stationary traffic for two junctions which would add 30 minutes to his journey time. "I do find it makes it a long day. 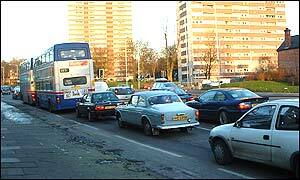 The traffic congestion into Birmingham adds two hours onto my working day." Wendy Shale, who works outside the city centre in Edgbaston, said she found it quicker to walk into work. "It takes me an hour to drive 12 miles to work and then ages to try and find somewhere to park where I won't be given a ticket or have my car unknowingly towed away." Birmingham City Council's head of transportation strategy, David Bull, said there were no plans to introduce a congestion charge in Birmingham. The council had brought in a number of schemes to combat congestion, including a Safer Routes to School scheme which had encouraged more people to either walk or use a bicycles to travel shorter distances. More than 150 companies in the city were involved in the Company Travelwise scheme to promote public transport to their staff, he added. "We plan more traffic control systems to help reduce congestion and increased rail capacity through New Street station," he said. Do you agree with congestion charges?